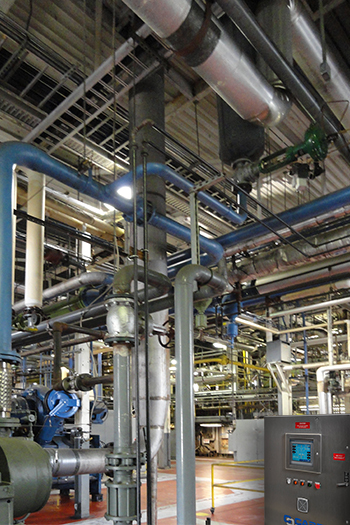 Many compressed air distribution systems are comprised of multiple headers that deliver air at different pressures to meet the needs of the process machinery. Often modulating valves are used as a “Cross-Over” or “Bleed-Down” from a higher pressure header to one that is lower. In some applications, either header could dip lower during periods of peak demand and need a contribution from higher pressure air from the other header. Another common application for these valves is to modulate air stored at a much higher pressures to meet the varying demand of the plant or process. Sometimes the process needs to be highly coordinated with the Master control scheme managing the compressors on one or multiple headers. When a stand-alone controller is appropriate for this application Case offers AirGate™ a PLC controller with HMI to measure pressure on both headers and command the control valve with the same innovative forethought applied in other Case solutions.